Issue #30: The Man of Many Hats – November/December 2017 | NF Magazine, Made by the Nintendo Force! Are you familiar with someone “who wears many hats”? Asking about the phrase itself here. If you’re not, I should explain in order to make this issue’s name and theme make sense – it’s a title traditionally given to someone who has a lot of different jobs, but somehow manages to do them all well. Like a busy, overworked parent who’s able to balance raising their kids with the demands of their work outside the home, or maybe someone in an office setting who runs around the building serving in several roles while most everyone else sits in one spot, doing just one thing. We’re taking the liberty of applying the title of “The Man of Many Hats” to Mario now, and we do so because, well, of what I just described: Mario is the most versatile character in the history of the video game industry, starring in a huge variety of different games, taking on more roles than anyone else ever has. A platforming hero. A go-kart driver. A prescription-hurling physician, a party animal . . . an Olympic athlete, for goodness sakes! There’s nothing he can’t do. That’s just covering the figurative meaning of the phrase, though. If you take it literally, it still holds true! Mario has worn tons of different actual hats beyond his signature red cap over the years, both through costume changes and from the power-ups he’s grabbed that have shifted his shape and style. We look back on his changeable nature here in this issue, as Super Mario Odyssey is now giving him more wardrobe options and body shapes than ever before, all packed into one epic adventure around the globe! 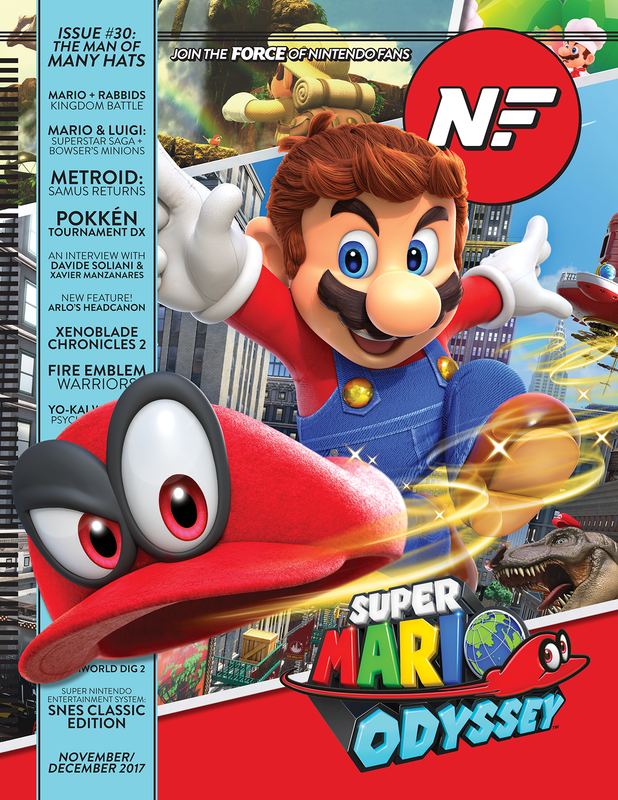 I hope you enjoy this all-new NF issue, and I hope it renews your appreciation for Mario – truly the Man of Many Hats! As always, print editions of this new issue ship with double-sided wall posters to hang up in your home. This time, you’ll have your choice of official Super Mario Odyssey art on one side, or a new original art piece by Thor on the reverse depicting Mario crashing Bowser and Peach’s wedding! BUT WAIT! This being our milestone 30th issue of NF, there’s a special surprise inside: a bonus second double-sided wall poster! The second one features artwork from Pokémon Ultra Sun & Ultra Moon on one side and Xenoblade Chronicles 2 on the other. No extra charge for the extra poster, either!